This mouthwateringly entertaining film travels the globe to unravel a captivating culinary mystery. General Tso's Chicken is a staple of Chinese-American cooking, and a ubiquitous presence on restaurant menus across the country. But just who was General Tso? And how did his chicken become emblematic of an entire national cuisine? Director Ian Cheney (King Corn, Big River, Truck Farm, The City Dark, and Bluespace) journeys from Shanghai to New York to the American Midwest and beyond to uncover the origins of this iconic dish, turning up surprising revelations and a host of humorous characters along the way. Told with the verve of a good detective story, THE SEARCH FOR GENERAL TSO is as much about food as it is a tale of the American immigrant experience. "An extraordinary film! The Search for General Tso is a smart, funny and thoughtful resource for the teaching of the relationship between culture, power, food, and immigration in the United States." "More than just a biography...Viewers are treated to an exploration...The film is packed with historical imagery and warm humor, making it a joy to experience." "[The Search for General Tso] keeps digging and digging until it has not only solved the enigma of this particular dish but cast a light on an entire secret chronology of food, immigrant culture, and the way the two amplify each other. The film does so with great affection and brisk style but also with a nose for the truth." "Smart, well balanced, and briskly paced, The Search for General Tso is highly recommended." "What happens when you put Julia Child, Sherlock Holmes, and Jackie Chan in a fiery wok? The answer can be found in The Search for General Tso, a highly entertaining and informative film...Told with humor and filled with valuable history and insight, this film is a must-see for anyone who not only loves to eat but loves to think seriously about why we eat." "Highly Recommended...Well-crafted...Expertly written, produced, and edited, this award-winning documentary is of interest to general audiences and dedicated foodies alike." "Smart, informative...fascinating...The Search for General Tso is a celebration of a culture, survival, tolerance, basic pleasures and the rewards reaped by all concerned." "A beautifully filmed story of Chinese American food from coast to coast, assembling a remarkable cast of experts. It would fit perfectly into any US History course, an Immigration course or Food History. It deftly explodes the whole idea of authenticity in cuisine, showing through a single dish how cooking is always a matter of evolution." "As fascinating a documentary as it is unique...The film delivers facts in a fun, fast, and fashionable way...Foodies and filmgoers alike are fortunate Ian Cheney took the time not only to ask the questions, but to answer them." "The Search is partly a mystery story centered around the origins of General Tso's Chicken, but also an extended and fascinating treatment of Chinese food in America. Especially intriguing is how Chinese dishes get transformed to appeal to American palates; who owns Chinese restaurants; and how they see their customers and competition. The Search is lyrical, even magical, and often funny as well as moving." "A brilliant gastronomic history of one of the favorite selections on Chinese restaurant menus as well as a social history of the Chinese in the USA." "My students love The Search for General Tso, an entertaining odyssey to find the real story behind the popular Chinese takeout dish. I love that it traces multiple histories of Chinese migration to the United States through food, in an accessible and thought-provoking manner." "Opens a window on to the complex history of Chinese-American relations in a finger-lickin' good foodie docu." 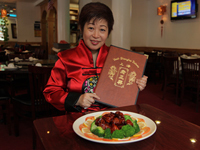 "The wildly popular chicken dish, named after a general of Imperial China who never tasted it, contains one of the fascinating hidden stories of Chinese food, America's most popular ethnic cuisine. Understanding stories such as this will enrich your Chinese-food experience." "It's a blend of fanciful, cultural detective work and offbeat, culinary road trip...An hour after watching it I was hungry to view it again." "An apt vessel for the mystery dish at its center." "Fun and visually engaging...The Search for General Tso is a jovial detective mystery that probes the many twists and turns in America's complicated relationship with people and things deemed 'exotic.' The film lends itself to lively classroom discussions on a range of topics such as American race relations, how food shapes our sense of identity, Cold War politics and its influence on food, and the construction of economic hierarchies of taste." "More fun and more enlightening than an investigation into a menu item should be." "The Search for General Tso is an entertaining contribution to the history of Asian American food." "It's quite amazing how many surprises and insights director Ian Cheney finds...You'll never look at General Tso's Chicken the same way again."